Its turkey time, baby. It’s officially November and I can focus all of my energies on one of my favorite holidays – Thanksgiving. I love the feeling of this time of year – everyone is together, yummy food and festivities. I’m wanted to share with you how I go about planning during this festive time. My planning process is one that has been iterated on over the past several years. I know when you see the length of it you are going to be worried. Don’t be. It’s not meant to be prescriptive, just pick and choose what you want. If you have a process that works for you, then just keep doing it. This is meant to be helpful, not burdensome. So with that said, I am a firm believer in the old adage that 1 minute of planning saves 10 minutes of doing. If I’m trying to accomplish something, I have to have a plan and I have to have lists. I need to know what I’m doing and when I’m to do it. I’m all for spontaneity and there are indeed times when it’s best not to have a plan but not necessarily when prepping for Thanksgiving. So here is how I do what I do – its part Martha Stewart, part Epicurious and part me. – Set guest list and invite guests with an RSVP deadline (should be 4 weeks ahead). Be sure to be flexible just in case there are any last minute additions. – Begin to plan your menu. Compile specific recipes. Decide on a buffet, plated or potluck style of meal. – Decor and table setting. – If you planned on doing any projects in your home, now is a good time to take care of them. – You should have a near final headcount. – Make your shopping list – divide into non-perishables and perishables. – Make the list of any additional equipment you might need. – Finalize your serving plan by determining how each menu item will be served and make a list of any serving equipment you’ll need to buy. Don’t forget to make sure you have plenty of plates and flatware for each course. 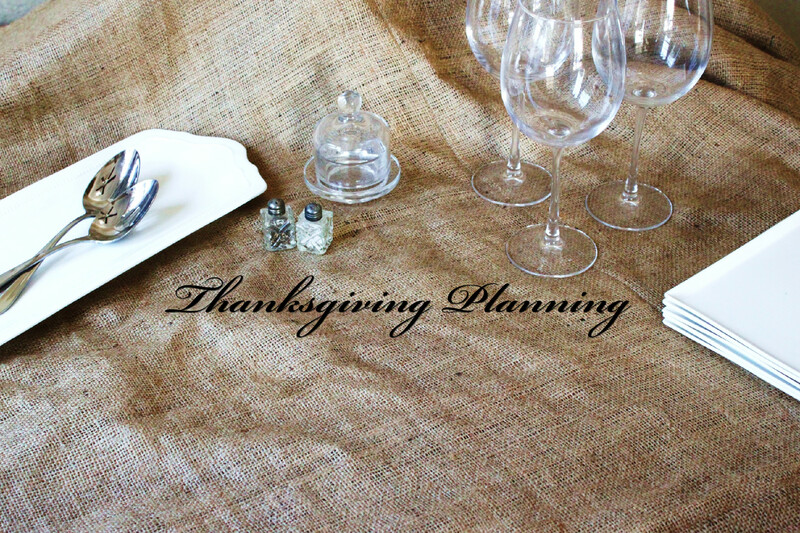 – Finalize your plans for decor and tablescapes. Make a list of any items you may need – such as centerpiece materials, candles, a wreath for the door, etc. – Think about anything else you want to get or do for your home, such as buying new guest towels, etc. – Order your turkey. It’s especially important to do this earlier than three weeks out if want a special kind. – Order anything you won’t be able to find in local stores, such as exotic ingredients or specialty cooking gear. – If there’s anything on your list that you don’t want to buy (such as extra folding chairs), arrange to rent or borrow them. – Divide the rest of your list by when you’ll buy the items. – Based on this cooking plan, divide the perishables on your list by the date on which you’ll buy them. Aim to buy perishables no more than three days before you’ll be cooking them. – To avoid clutter, clean out your cupboards and make room for the things you’ll be buying. – Clean the freezer to make room for the items you’ll be freezing. – Buy all non-perishables and gear. – Buy the perishable ingredients for the items you’ll be making this week. Cook as many things as you can now. Good candidates: pie dough, bread, and turkey stock. All of these can be frozen and defrosted just before Thanksgiving. – To get as much done ahead as possible, also make any nonperishable table decorations (such as pine-cone napkin holders or centerpieces) this week. If you’ll be hosting house guests, make sure you have clean sheets and towels. Clean the house, press table linens, and polish silver. – Do a big fridge-cleaning: Clear out as much as you can to make space for all the ingredients and dishes you’ll need to refrigerate in the coming week. – If you’re getting a frozen turkey and haven’t bought it yet, also buy that on Saturday and stow it in the fridge to defrost. It’ll need about five hours per pound, so a 15-pound bird bought on Saturday should be thawed by Tuesday evening. You can keep it in the fridge for a couple of days after it’s thawed. If your turkey is much larger, buy it sooner to give it ample time to defrost. – If brining your turkey, prep it and leave it in the brine overnight. – Defrost pie crusts and turkey stock. – Assemble and bake pies; store them at room temperature (unless they’re custard-based, such as pumpkin pie, which should be refrigerated). – Prepare any side dishes, such as mashed potatoes, that can be made ahead and reheated in the microwave. – Clean and dry salad greens and store them in a resealable plastic bag. – Do one final clean- up. – Set the table. Arrange chairs; set out flowers, candles, and any other decorations. – Turkey comes out of the fridge first thing, give it 2 or so hours to come to room temperature. – Put the turkey in to roast. – Defrost breads and any other prepared items that have been frozen. – Chill white wine and beer. Set up the bar for any other drinks you’ll be making. – Set out your serving platters and dishes nearby. – While the turkey is roasting, complete all the other dishes. Let them stand at room temperature or, if ready more than one hour ahead, refrigerate. – Whip the cream for dessert. Keep in fridge until ready. – Prepare the coffee but don’t turn it on yet. Get the coffee cups, sugar and milk (keep jug in fridge until ready) ready to go on a serving tray. – When the turkey comes out, let it rest while you make the gravy and reheat the side dishes on the stove top, in the oven, or in the microwave. – Place sides in serving dishes. I turn the oven off and put the sides (in their serving dishes) in the oven to keep warm (make sure the dishes are oven proof). – Carve the turkey and serve the meal. – Time to serve coffee and dessert. – Be sure to have to-go containers for guests to take leftovers. I use Chinese take- out boxes and I have a pen nearby ready to label.